Alan Davidson delivered with bat and ball for APD Dumfries on Saturday as they registered a comprehensive win at Renfrew in the Western Premier League. Dumfries set a total of 188 for 9 in a rain affected match reduced to 41 overs. Opener Davidson top scored with 54 aided by middle order runs from Drew Dawson and Scott Beveridge. Renfrew looked well set at fifty for no wicket, but Beveridge started the slide bowling Hendrickse for 32. Davidson came on to bowl the other opener, the professional Said, and then transformed the innings by taking four wickets in his sixth over, including a hat-trick. Renfrew found no way back as remarkably five wickets fell with the score on 74. The Hole in the Wha’ Man of the Match Davidson finished with 6 wickets for 17 and Beveridge claimed four wickets as Renfrew slumped to 98 all out. APD Dumfries play at Drumpellier in the league on Saturday. Meanwhile Eco-Genics Nunholm also had a dramatic win by two wickets over Renfrew 2nds, Deanpark, in the CSL Premier Reserve League. Deanpark hit 193 all out with Chris McCutcheon producing another impressive bowling performance taking 3 wickets for 6 runs in 7 overs. 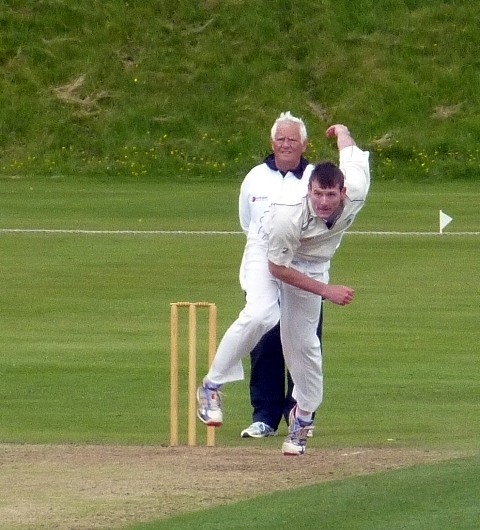 The Dumfries side had reached 81 for 5 when McCutcheon hit Nunholm into the game with a rapid 40. However when he was caught at long-on Nunholm looked second placed at 128 for 6. Then two Strachan partnerships kept hopes of a win alive. Fraser and David Strachan added twenty. Then a near forty run sibling partnership between Fraser and Kirsty Strachan was only broken with just seven needed. Nevertheless, the Scott Beveridge Plumbing Man of the Match, youngster Fraser Strachan, was there at the end after a match-winning 41 not out for a two wicket victory. On Saturday the side play Langloan at Nunholm. Junior Cricket: Junior coaching sessions continue at Dumfries Sports Club, Nunholm, on Mondays from 6:15-8. Contact the Club about senior, junior and womens’ cricket on 07799 856094, dumfriescricketclub@gmail.com , or see http://www.dumfriescricketclub.co.uk, @dumfriescricket.